Charles Bachand, when not tooling around town in his 300ZX can usually be found racing R/C cars or busily managing his own area on DELPHI, the Hobby SIG. His username is appropriately, BACHAND. Oh, why did they do it? Why did Atari implement a high-speed DMA port instead of what everybody wants and needs, namely a true SCSI port. It would have only cost them an extra dollar or two to have incorporated SCSI (small computer systems interface) into the original design of the ST computers; but they probably didn't envision back then the large percentage of users who would be adding hard-disk drives to their systems. With more and more STs being used for business application, a hard-disk drive is now considered a must-have item. The Atari ST's DMA port "can" communicate with SCSI devices (hard disks, streamed tape backup, CD-ROM drives, etc. ), but it is not easy. SCSI is not compatible with the DMA port that Atari implemented. The signal lines (SCSI uses a 50-conductor flat ribbon cable, while the DMA uses only 16 signal wires), timing and protocol are different. Some of these differences are slight, but enough to matter—thus the need for a DMA-to-SCSI adapter board. My approach to building a hard disk was a little different from Andy Eddy's (see "Frankendrive," ST-LOG #21), in that I chose to go with a drive mechanism with an imbedded SCSI Hard Disk Controller. Normally, imbedded SCSI drives are more expensive than going the separate drive/controller route, but you see, I got this great deal on a 54-megabyte unit at a local computer flea market. Well...you know. You should not confuse a SCSI Controller with a SCSI Adapter. A controller is a dedicated micro-computer that accepts commands and data from your computer system to read/write to a hard-disk drive unit. It then sends the results of your computer's commands (the data being read, acknowledgement codes, error messages, etc.) back to your computer. The SCSI Adapter merely changes the interface signals so that they're now compatible. The data, however, remains the same. In a sense, the whole thing is akin to the chain of command in the army. The general (your computer) wants a file that he left in his jeep (a track on the hard disk) in the parking lot (hard-disk platter). He gives an order to his aide (the DMA port) to retrieve the information; but since the general's aide can't leave the office, he calls up the captain (SCSI Controller) via the telephone (DMA-to-SCSI Adapter) to relate the general's (computer's) orders. The captain, who loves to be a captain, yells at the sergeant (the hard-disk controller—yes, there is a microcomputer in each and every drive mechanism as well), telling him which parking lot and which jeep to locate and just what to do with it when he finds it. This sergeant, however, is not into physical labor, so he yells at a lowly private (the hard disk's read/write head), who just happens to be already running around the parking lot, and tells him which jeep (track) to go to. Unfortunately, the lowly private finds much more than one folder (sector) in the jeep. These jeeps seem to hold 17 folders—although some camp parking lot’s vehicles will hold 25 (RLL encoded drives). The private has no choice but to take all 17 folders back to the sergeant, who can’t make heads or tails of them either, and passes the whole mess along to the captain, who, being a relatively smart guy picks out the correct folder and sends it along with a report (command acknowledged, etc. ), back up through the proper channels (SCSI/DMA Adapter to DMA port to your computer). Of course, all this talking back-and-forth happens very quickly, taking less than a second to read or write a 100K file. You have to know what you are doing when designing hardware that deals with binary information at these speeds. Two companies that certainly have their act together in this regard are ICD and Supra—both of which manufacture and market Atari hard-disk systems, as well as the all-important DMA-to-SCSI Adapters. We’ll take a look at their adapter boards in this review. Hey, buddy, got the time? 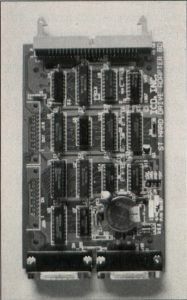 The ICD SCSI adapter board is a multifunction unit. Not only does it handle the all-important functions of communicating with your disk drive, it also keeps continuous track of the current date and time. This is accomplished through the addition of a few extra parts to the ICD PC-board, namely, a real-time clock chip, assorted transistors, resistors and capacitors, a quartz timing crystal and a lithium battery. The battery powers the clock circuitry continuously so that the board never forgets what time it is, and, since it is a lithium battery, you needn’t worry about it dying on you for at least four to five years. The clock communicates with your computer as SCSI Device 6. If for some reason you need this slot number and don’t mind losing the clock functions, there are instructions in the manual on how to deactivate it. This involves cutting two traces on the PCB and also adding two jumper wires. Fortunately, the chances that you might need to perform this operation are slight, to say the least. 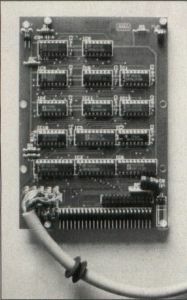 The DMA I/O ports (two DB-19 connectors on the back of the board) have their traces running to solder pads located on the side of the board also. This was done in case you or ICD needed to change the position of the SCSI Adapter as it is mounted in the drive case to accommodate any future needs. Another advantage to using two DMA connectors (one IN and one OUT) is that you can now daisy chain other DMA devices onto your system. This means that you can also use an Atari or Supra hard-disk drive, or even the Atari laser printer in conjunction with an ICD-equipped drive. The 50-pin header connector that retains the ribbon cable going to the SCSI Controller uses gold-plated pins to both decrease electrical resistance and reduce the chance of corrosion. The connector also incorporates ejector latches to ease the strain put on the ribbon cable by insertion and removal. The cable, with every other wire being tied to the electrical ground, acts as a shield that blocks radio frequency noise from being transmitted to adjacent conductors. Coupling this with the use of signal buffering chips and noise-reducing terminating resistors allows you to have up to 20 feet of ribbon cable (the design limit for SCSI devices) between the Adapter and SCSI Controller—a sharp contrast to the two-to three-foot maximum limit put on the DMA cable itself. The ICD hard-disk formatting software will handle a wide range of SCSI Controllers and drive mechanisms—including several imbedded SCSI drives similar to my flea market special. The software can operate on over 120 different drives and over a dozen different controllers. If your unit is not on ICD’s list, but you have the specifics, such as number of heads, number of tracks, step rate, etc., concerning it, then it is a simple matter to edit the ICDFMT.DAT file to include your particular unit. If you happen to have an odd-ball controller card that you’d like to use and also have access to Personal Pascal (previously from OSS but now marketed through ICD), you can write your own device driver for it that the formatting software will recognize. Several examples of controller software are included for Adaptec and Xebec controller boards to get you started. The adapter board from Supra Corp. is almost as nice as the ICD unit, and both units have many features in common. So I’ll only be pointing out the differences here. The PC board is somewhat smaller due to the fact that it does not contain the circuitry to accommodate an on-board real-time clock. A clock chip was one of the first things to be added to my ST way back when, so I did not miss that particular duplication of effort. This would also hold true for the new Mega ST computers that come with a factory-installed clock. There is no DMA-through connector. In fact, there are no onboard DMA connectors at all to speak of. It seems that the female DB-19 connectors used by Atari for this application are somewhat hard to come by; so Supra decided (at least they did on this version of the board) to solder the three-foot DMA cable directly to the appropriate solder pads. Of course, there are advantages as well as disadvantages in doing this. There is now no need to cut a large hole in order to mount a connector: A 3/8-inch opening will do nicely to pass the cable through. However, removing the cable from your drive now becomes difficult to nearly impossible since the cable has become a permanent feature of your hard disk. Supra’s formatting software, while not handling as many different drives as ICD’s, does allow you to add in data on your own hard disk via editable text fields within the formatting program—somewhat easier than calling up a text editor to change a configuration file as ICD chose to do. The software winner for me was Supra’s SUPEDIT.PRG program. This utility allows a knowledgeable (I stress that word heavily) person access to the deepest recesses of the hard disk: the nooks and crannies containing the boot sector, partition information and file data. This program has saved me many a time, but for those who do not know what they are doing, SUPEDIT.PRG is like a loaded gun with the safety off! It is very easy to make a complete mess of a perfectly good hard disk. Be warned. If you are curious as to which board I finally gravitated to and why, you just might be surprised. Both units performed equally well in my application. I did not need the on-board clock or DMA-through connectors, and both the DMA and SCSI cables were limited to two feet in length. For me, for the most part, it was still a toss-up. Now, since I couldn’t very well install both adapters in my hard-disk case—an IBM AT-style tower case—I chose to use the Supra board. The reason? Its mounting holes more closely matched those in my case than ICD’s holes did! Yes, it is a stupid reason, but then I really hate drilling holes. If things had matched up better the other way, and, all else still being equal, the ICD unit would be gracing my drive. It’s just too bad that my computer doesn’t have two DMA ports on it. Then I could have the best from both companies!